Part of the M6 is to be closed for 10 days from this Friday. 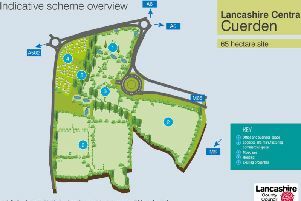 Highways England is advising drivers who use the northbound M6 out of Lancaster that the entry slip road will be closed around the clock, as part of Lancashire County Council’s £124m Heysham Link project. Experts say work to complete the slip road onto the northbound M6 requires the closure of the existing slip road, which will be taking place between 8pm on Friday and 6am on Monday August 1. The new road – to be officially named the Bay Gateway later this year – will link Heysham with junction 34 of the M6, which is operated by Highways England. Highways England project manager Paul Elliott said: “Although Heysham Link is a county council project along the local road network, its connection to the M6 is delivering significant improvements at junction 34 of the motorway with better entry and exit slip roads. During the slip road closure, drivers will be diverted along the A6 and join the northbound M6 at junction 35 at Carnforth. High sided vehicles will be diverted onto Kellet Road (B6254) in Carnforth to avoid the low railway bridge on Scotland Road (A6).